I am affected by some type (Red-Green, Blue-Yellow, Complete...) of color blindness. Can I even play 12 orbits? If you are affected by some type of Anomalous Trichromacy or Dichromacy, you will be able to select colors that fit your needs most of your time, as long as you are playing with up to 8 players. 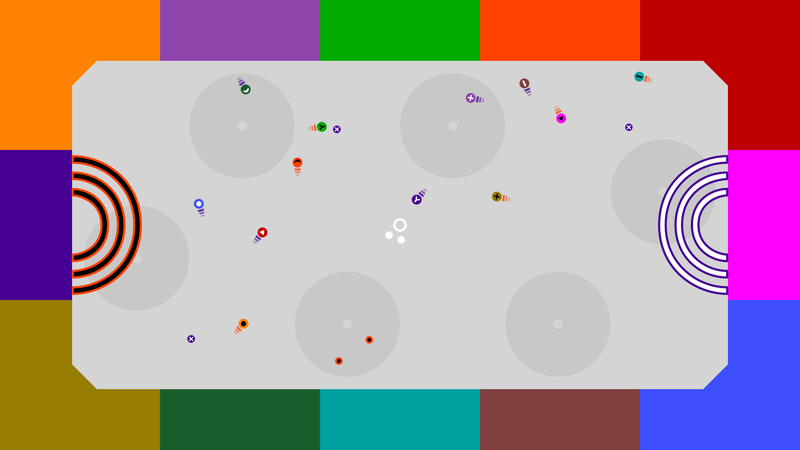 For everything else (more players, complete color blindness), 12 orbits has a built-in colorblind mode. It places black and white symbols on your player characters and the spheres you activate. Teams, goals and scoreboards are based on these symbols as well. How can I activate the colorblind mode? You can select it from the options menu right after starting the game. After activating the colorblind mode, the player select screen and all game modes will change accordingly. If you had already chosen teams for all players, you may need to repeat that process, as the players are now separated into teams based on their symbols, not their main color. Will these symbols work for me specifically?